First things first: Thanks to Angry Robot and NetGalley for providing an e-ARC for review. Being provided this ARC in no way, shape, or form influenced my thoughts on this novel. 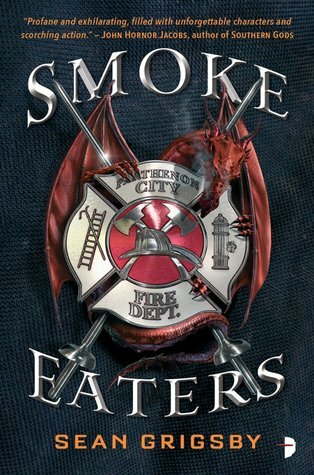 I also want to thank Peter McLean for his advanced praise of Smoke Eaters. His words definitely influenced this novel being at the top of my TBR when I received the ARC and held true throughout my reading experience. Cole Brannigan has only one thing on his mind: retirement. Thirty years as a firefighter has taken its toll not only on his body, but his mind. Not to mention that, over the past decade, most of the fires he is tasked with extinguishing were started by dragons. Yeah, you heard that right: DRAGONS. Not the glorious winged beasts you see flying around in Game of Thrones; these are flightless lizards that come up from beneath the ground, laying waste to homes and entire neighborhoods. On what Brannigan thought would be his last fire call, he becomes oddly aware that he can breathe dragon smoke without all of the disgusting, and sometimes fatal, side effects. Well, he can go ahead and kiss retirement goodbye because he is now being recruited as a Smoke Eater: a fighting force endowed with the same ability and equipped with some of the latest in high-tech weaponry. Now on the bottom of the pecking order, he must quickly learn how to combat these beasts with his fellow company before his goose is cooked, literally. Smoke Eaters is a crazy AF, edge of your seat thrill-ride that will have you begging for more. Dragons, wraiths, laser weapons, and fire… LOTS OF FIRE. What more could you ask for? Grigsby does a fantastic job drawing the reader into the story with his introduction to Brannigan on his last fire call. Brannigan is officially one of my favorite characters of all time and, IMO, Smoke Eaters is perfect for those looking for a hangover read after Kings of the Wyld because of this fact. Think grizzled old vet, coming out of retirement to do something completely BA in a post-apocalyptic world. Just don’t expect world-building here as a majority of the story takes place in Ohio. Come for the dragons, stay for the character building. You won’t regret it. Smoke Eaters releases on March 6th of this year and needs to be at the top of your TBR.